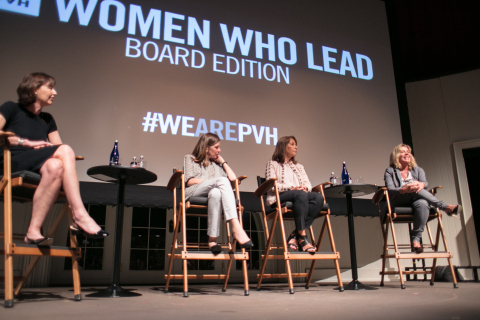 PVH hosted a special session of its "Women Who Lead" speaker series featuring members of the PVH Board of Directors. NEW YORK--(BUSINESS WIRE)--PVH Corp. (NYSE:PVH), one of the world’s largest apparel companies and owner of iconic brands including CALVIN KLEIN, TOMMY HILFIGER, Van Heusen, Speedo, Warner’s and IZOD, today announced it has been named to Forbes magazine’s inaugural list of America’s Best Employers for Women. PVH ranked No.187 overall. Inclusion & Diversity is central to how PVH conducts business and the company continually advances its commitment to its associates by incorporating feedback from its associate engagement survey, known as PVH Listens. PVH has also introduced Business Resource Groups (BRGs), voluntary, associate-led groups that share commonalities to foster inclusivity and support the company’s business objectives. Current BRGs include groups supporting women, working parents, LGBTQ associates and African American associates. The company recently introduced several programs, such as a global pay equity audit, an expanded parental leave policy and the launch of a flexible workplace program in the United States in response to input from these initiatives. “As a member of PVH's Inclusion & Diversity Council, I’m proud to be involved in creating a culture where inclusivity is engrained in our Core Values, and women feel supported and empowered to reach their full potential,” added Dana Perlman, SVP, Treasurer, Business Development and Investor Relations. PVH has taken actions to advance gender equality, including its commitment to the UN’s Women’s Empowerment Principles and support for initiatives such as the United Nations’ HeForShe initiative and the Human Rights Campaign. Earlier this year, PVH committed to the United Nations’ Free & Equal Campaign to support LGBTI rights and also joined the CEO Action for Diversity & Inclusion, a company pledge to take advance inclusion and diversity in the workplace. PVH was also recognized by Forbes as one of the 2018 Best Employers for Diversity and named to its list of the Most Just Companies. Forbes, with data partner Statista, surveyed more than 40,000 employees, including 25,000 women, at companies across the country. The top 300 companies of those surveyed were named as The Best Employers for Women 2018. The ranking took into consideration general workplace factors, including diversity, development and working conditions in addition to topics particularly relevant for women, such as parental leave, flexibility, pay equity and family support. Forbes and Statista also examined diversity in top executive and board of director roles. For access to the full list of America’s Best Employers for Women, visit https://www.forbes.com/best-employers-for-women/list/.